Bridge Road Brewers has brewed beers with dozens of beer venues over the years as part of its Bar Series. The Beechworth brewer has also looked to work with restaurants over the years, whether on dinners, beer launches or just being part of a push for more diverse beer lists, often via its Chevalier Saison. 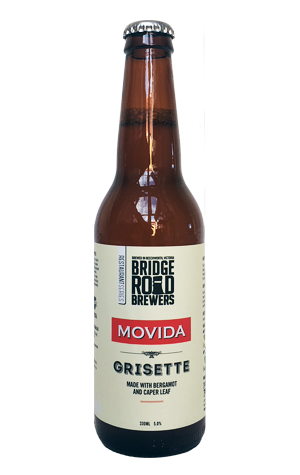 So its Restaurant Series, launched with this beer created in conjunction with Melbourne's Movida – and in the same vein as Edge Brewing Project's work with the likes of Brae – feels like a logical progression. The restaurant team's request was for a beer suitable for its bars as well as pairing with food, which featured produce from the brewery's home region. That produce comes in the form of bergamot from Mountain Yuzu and brined caper leaves from Long Lane Capers. They've been added to a Belgian farmhouse style grisette, lending the beer perfume like qualities reminiscent of liquorice or star anise. It's herbaceous and savoury, yet light and aromatic too, with a finish that's dry, peppery and offers a little citrus rind like bitterness. In other words, plenty to play with for the Movida group's chefs and bar staff.